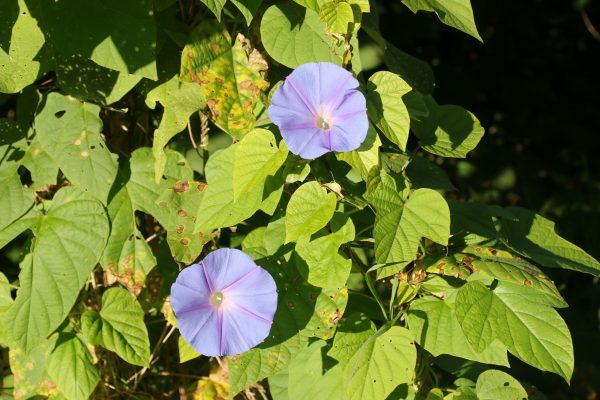 Blue Morning Glory (Ipomoea indica) is a perennial, twining, vigorous climbing vine to 15 m high or a scrambler over low vegetation. Specimens may live up to 25 years. It has softly hairy, heart-shaped and sometimes 3 lobed leaves. The very showy funnel-shaped flowers are bright blue or bluish purple with pale pink centres. New flowers open each day fading to pink by late afternoon. Mature vines flower from spring through to mid–autumn, with sporadic flowering occurring at other times. 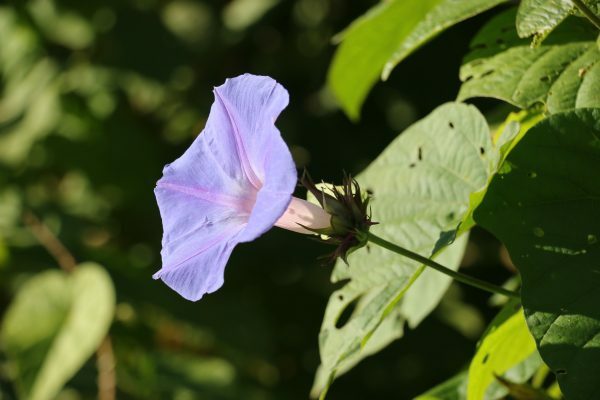 Morning Glory is believed to be a native to the tropics of Central and South America and possibly also native to south-eastern Asia. It is naturalised, particularly in coastal districts of Eastern Australia. In Qld it occurs as isolated populations along the east coast. One of the largest infestations exists on hillsides in the Montville/Maleny area. It is a significant environmental weed in Qld, NSW and Vic. Originally introduced as a garden plant, it is now a common weed invading rainforests and bushland reserves, growing over fences and old buildings. This garden escape is now a weed of waste places, roadsides and disturbed areas and smothers trees and shrubs. It reproduces primarily from broken fragments of stems that produce new roots at the nodes. Hence, the most common mode of dispersal is believed to be as a consequence of gardeners dumping unwanted vegetative material. It does not produce viable seeds in Australia.